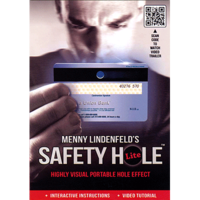 Today, when you order "Safety Hole Lite 2.0 by Menny Lindenfeld", you'll instantly be emailed a Penguin Magic gift certificate. You can spend it on anything you like at Penguin, just like cash. Just complete your order as normal, and within seconds you'll get an email with your gift certificate. From the mind of Menny Lindenfeld, who brought you best-selling Hollow and Hollow 2, comes a new highly visual portable-hole effect that will fool even the keenest of spectators. Show your credit card, with a hole punched through its magnetic stripe. Suddenly grab the hole with your fingertips and PHYSICALLY SLIDE THE HOLE out of the way, nice and easy, to another spot on the card. End by SHAKING the card - causing the HOLE TO VISUALLY JUMP back to the magnetic stripe. Conclude by letting the audience examine your theft-proof card. With Safety Hole Lite you will always be ready with an amazing trick up your wallet. For the first time, Safety Hole Lite comes with interactive instructions that give you an exiting and personal learning experience. 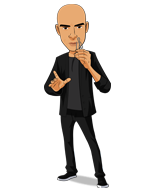 Enjoy a step-by-step video tutorial, directly on your mobile phone (or PC), presented by magic inventor Menny Lindenfeld! 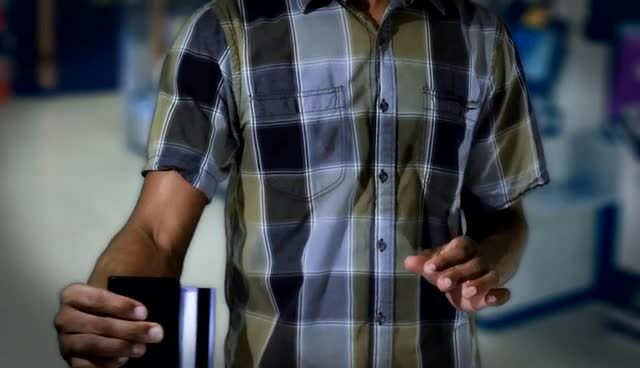 You have to replace the credit card back into the plastic wallet at the end of the routine before it can be examined, which makes it totally unnatural. This trick dosen't give nothing new, the video alone skilful hides the faults of it. I recently performed this for several people and the fellow sitting next to me was practically going into shock and just kept yelling let me see it. His eyes were big as dinner plates. I got tremendous reactions from everyone. I love it, it takes up so little room and packs such a wallop. I love the wHOLE moving hole theme and this is one of the best, particularly because of it's durability. I cannot say enough good things about it, only to caution purchasers to learn the one move well and then be prepared for the onslaught of attention you will get. THIS IS A KEEPER.